A pair of pivotal scraps have been added to the UFC on FOX 11 lineup. 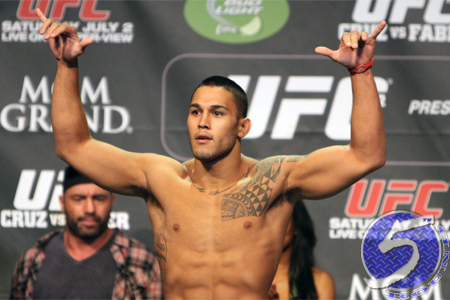 Middleweights Brad Tavares (pictured) and Yoel Romero, as well as lightweights Pat Healy and Jorge Masvidal will collide in the April 19 event. The UFC announced the bouts late Tuesday night via Twitter. Tavares will be riding a five-fight winning streak into the fight. He’s fresh off January’s unanimous decision victory over Lorenz Larkin. Romero has rattled off three consecutive victories, with his most recent coming last month in a TKO over Derek Brunson. Healy and Masvidal, meanwhile, are both looking to right the ship. Healy dominated Jim Miller in his UFC debut, but had the win overturned to a no contest after testing positive for marijuana. “Bam Bam” has since lost his next two tangos. Masvidal is 2-1 after getting transitioned from Strikeforce. However, he dropped a decision to Rustam Khabilov in his last outing. Amway Center in Orlando, Florida serves as host.